I've always had a huge variety of interests. I had a terrible time deciding what major to pursue in college next year because there were so many careers I wanted to try: publicity, computer science, economics, accounting, and history were all subjects that I seriously considered majoring in at one point or another. I struggled with the idea of shutting doors on my future, of choosing one path and eliminating my chance to pursuing the rest of them. I eventually wound up choosing to double major in computer science and economics, which are two of my favorite subjects and ensure I will have a wide variety of appealing career paths to choose from down the road. 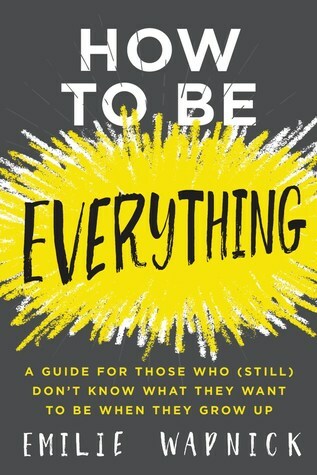 I say all this to provide some insight into my background approaching How To Be Everything. I have never considered myself to be a "straight arrow" person, which means that by Wapnick's definition of the word I must be a "multipotentialite" (a person with multiple passions and potential pursuits). The book is designed to introduce its readers to this term, a convenient label to put on those of us who have more than one interest, and then to offer different strategy ideas for incorporating diverse interests or even total career switches into one's working life. While I do like Wapnick's advice about following your passions (while always still keeping one eye on the finances! ), I'm not sure I agree with her idea that some portion of the population are multipotentialites, that they are a misunderstood and often oppressed bunch, and that they must basically "come out of the closet" about the fact that they are a multipotentialite and try to fight against restricting social norms that seek to make them have only one interest their entire life. Why do I not agree with this? Because I've never met anyone who wasn't a multipotentialite. If there's truly someone with only one interest out there, who never gets sick of their job or passionate about a side hobby or occasionally daydream about hopping careers, then they are the minority in this world. Honestly, I think most people pursue what Wapnick calls the "Einstein Approach," which is basically just having a good enough job and doing things that interest them in their free time. Gobs of people also follow the "Group Hug Approach," pursuing a career that encapsulates most of their greatest interests. I, to be perfectly honest, will probably do both of those: I'll have a "group hug" job that combines my love of tech and economics, and then I'll spend my free time reading and doing art projects and other things my job doesn't offer. This won't make me any sort of strange person or outlier–it's really a pretty normal path! The outliers are truly the ones who follow Wapnick's other models: the "Slash Approach," which is basically when you have a few different rewarding jobs simultaneously, and the "Phoenix Approach," which is when you pursue one career to an expert level and then start over in a new one. These subsets of Wapnick's "multipotentialites" are really the more rare ones, and these are the people who would find that the world isn't really designed for their eclectic career path. I suppose it's good that they are encouraged to pursue what really fascinates them, but I do hope they give things a full try before getting discouraged and moving on (and if they only have one year left in their PhD program, then for heaven's sake they should finish it!!). All in all, though, this was a pretty interesting self-help book that was very different from any other one I've ever read. It was quite engaging and easy to read, unlike most books of the genre that I have to drag myself through, and I honestly liked thinking about Wapnick's tips even if I didn't agree with all of her points. If you think this book is interesting, by all means do give it a try! Disclaimer: I received a complimentary copy of this book in order to participate in a TLC book tour.